Spread across 15 acres, The Heartsong is an exquisite offering of beautifully and efficiently designed air-conditioned apartments and penthouses in Gurgaon. Choose your pick from multiple unit size options in 2, 3, 4 BHK Apartments & Penthouses. The Heartsong is poised to be a destination of comfort, connectivity, convenience adorned with laidback elegance. Get set to explore another quality offering by Experion, a 100% FDI Real Estate Developer at Sector 108, Gurgaon. Experion Group is a 100% FDI of Gold Resorts and Hotels Pte Ltd Singapore. 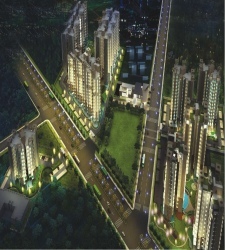 It started its operations in India in the year 2006 in real estate and hospitality sectors. Till date it has made investments of more than USD 230 million in procuring strategic project sites at various locations across India and will be developing those as niche products across various asset classes. At Experion we believe that good experiences foster enduring relationships. We offer transparency in transaction, thought-leadership in action, customer insight in our developments and thus, transform every relationship into positive, engaging, memorable experiences that people would love to come back to. With sizeable land parcels across India, Experion would be developing townships, group-housing projects, commercial landmarks, organised retail destinations, hotels and resorts across Delhi NCR, Haryana, Andhra Pradesh, Tamil Nadu, Uttar Pradesh, Goa and Maharashtra.